Entry Fee: $20 initial entry $10 for each additional image. 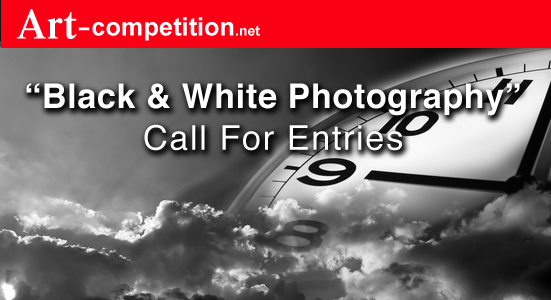 Art-Competition.net announces a Call for Entries for “Black & White Photography” in traditional and/or digitally manipulated photography, for an online Group Exhibition, up to 18 photographers will be chosen for the online exhibit. Theme “Black & White Photography” – Black and white photography of any subject where the photographer’s lens captures a moment in time, a facial gesture, a flicker, reflection, glimpse, movement or expression. The work can be expressed from representational to non-representational images. The Photographers and Exhibit will be extensively marketed with numerous Press Releases, Social Media Marketing, Event Listings & Event Calendars, and featured in our Art Market Newsletter with over 17,000 subscribers. PRIZE DETAILS: 18 photographers will be selected for the Group Exhibit “Black & White Photography” at Gallery25N’s online gallery. The exhibit and photographers will be extensively marketed with numerous Press Releases, Social Media Marketing, Event Listings & Event Calendars, and featured in our Art Market Newsletter with over 17,000 subscribers. Not eligible to enter? - Find contest where you are.